Collaboration lies at the heart of our work. 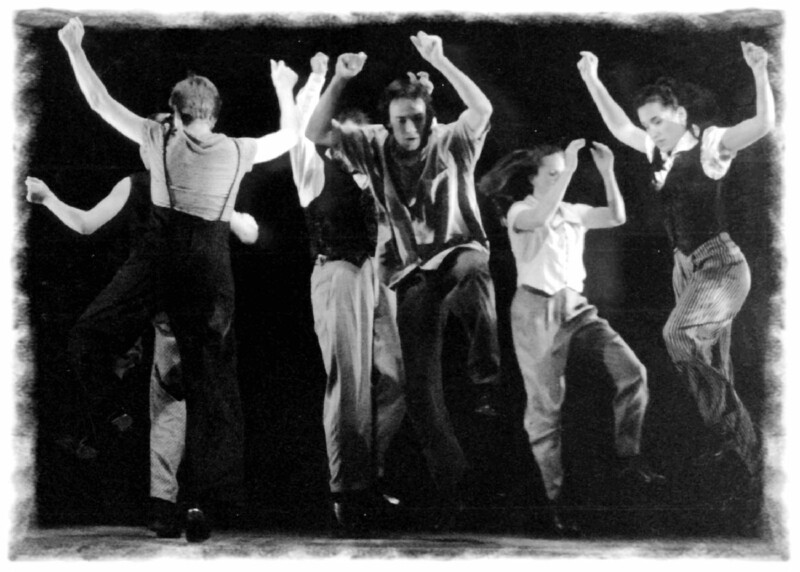 It figured prominently through the years with Rhythm in Shoes and continues to fuel our work today. Bands, individual artists, dance & theater companies, presenters & community groups; all have provided inspiration and partnership in the creation of a vast and varied repertoire. Most recently we collaborated with a large cast of talented professional and community artists to create a 40th Anniversary dance and music event for the Wheatland Music Organization, in Michigan. 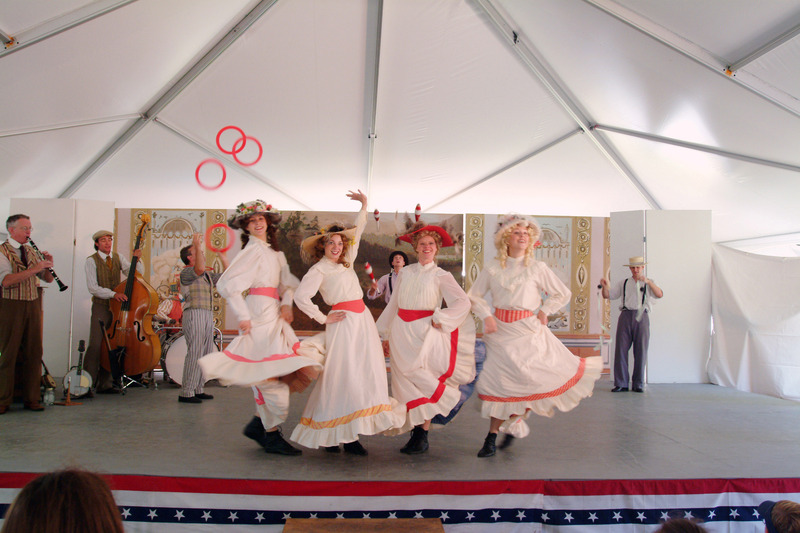 A Saturday night dance performance on the mainstage at the Wheatland Music Festival has been a highlight of many summers for us over the years. It generates excitement like nothing else can. 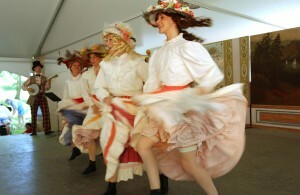 The WMO’s continuing commitment to traditional dance over the years is one of the things that makes it unique. Another is the Central Michigan community that has both supported and benefited from years of high-quality, traditional dance. It was fitting that the centerpiece of this summer’s 40th Anniversary Celebration, September 6, 7 & 8, was a Saturday night, main stage dance performance including some of the best professional dancers in the country, as well as performers from the greater Wheatland community. Having been commissioned to create this performance we, and a team of dedicated artists, brought forth what came to be known as the Carry it on… Project. The project is being directed by renowned artist and dancer Sharon Leahy with original music composed by Rick Good from the Rhythm In Shoes company of Spring Valley, Ohio. Both are well known and prolific creators as dancers, musicians, actors, writers, educators and advocates of America’s musical roots… Wheatland Music has a long, fruitful and trusting relationship with the duo that dates back to 1977. 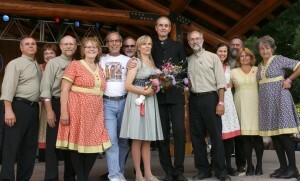 Over the four decades, Wheatland has engaged Sharon on more than 15 occasions and Rick 22 times. Forty years of people gathering to experience living traditional arts is what we celebrated with Carry it on…, but most folks don’t get the opportunity to experience the pristine beauty of the Festival site sans campers. So, after forty years of coming together at the Wernette Farm, outside of Remus, it was also fitting that we honored the magic of the gathering place with which we’ve been blessed. Although thousands of people annually populate these woods and fields, few of us have seen the land in its natural state. Those of us who have know there is a power there that brings us all together just as surely as the music and dance does. 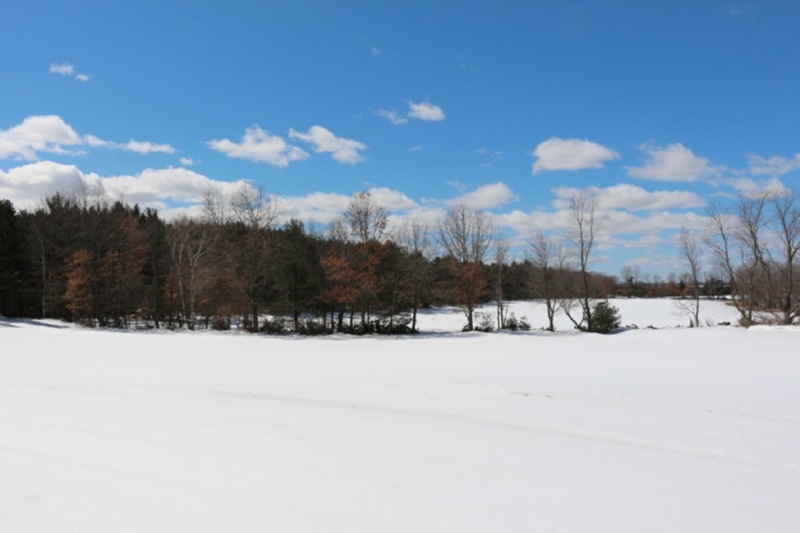 To this worthy end, Carry it on… also included a Dance for Camera performance-art film created, performed and shot on site at the Wernette Farm. The premiere showing of the Carry it on… film opened up the Saturday night dance set, blending seamlessly into the live performance. After the few first months of planning and brainstorming, the three major phases of the Carry it on… Project started running full speed ahead. 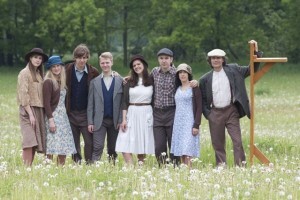 These were the Professional Ensemble, the Community Dancers and the Dance for Camera. Carry it on… included a handpicked team of professional artists who have performed at Wheatland through the years in groups like the Green Grass Cloggers, the Fiddle Puppets, Footnotes, Footworks and Rhythm in Shoes—dancers including Ira Bernstein, Christine Galante, Nic Gareiss, Matt Gordon, Becky Hill, Abby Ladin, Matt Olwell, Zane Terry and Emma Young. The bandstand was equally endowed with talented artists including Cleek Schrey, Sam Bartlett, Ben Cooper and Wheatland’s own Tom T. Ball. All of these artists gathered at WMO central this spring for two weeks of making magic. We lived well and worked hard, morning and night, creating new work for the stage under the direction of Becky Hill, and making the film, under the direction of Sharon Leahy. 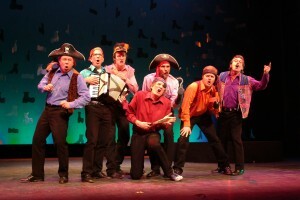 The Community phase of Carry it on… shifted into high gear last winter for three weeks of rehearsals throughout Lower Michigan. Joined by our talented colleague, the effervescent Nic Gareiss, we’ve been working with with dancers from fourteen to sixty-two in Remus, Alma, Mt. Pleasant, East Jordan, Ellsworth, Ann Arbor and Williamston, including the irrepressible Costabella Cloggers, many of whom are founding members of the Organization. The excitement of all the dancers, young and old, is both palpable and energizing. Carry it on… was a multi-faceted and ambitious undertaking, a year and a half in the making. It was the result of hard work and dedication from many talented artists. We are proud to have been a part of it. The Beggar tells the story. 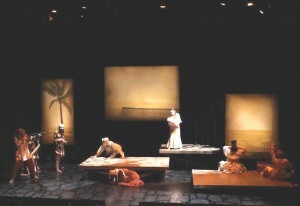 Our second major collaboration with Zoot Theatre Company was a stage adaption of The Pearl, from the novella by John Steinbeck. A scorpion threatens the baby, Coyotito. 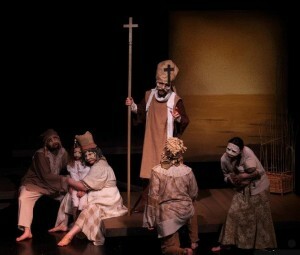 With remarkable direction by Sharon, this powerful tale of human greed and loss of innocence included original music by Rick and resulted in four emotionally moving performances from a strong ensemble of masked actors. The Priest visits the family. 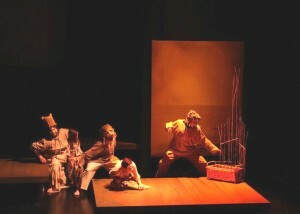 The Pearl was presented in the Mathile Theater at the Schuster Performing Arts Center in Dayton. Kino meets the Pearl Buyers. Original music from the LeahyGood/Zoot Theatre production of The Pearl, composed and performed by Rick Good, will be available soon. If you are interested in obtaining a limited edition CD of the recorded soundtrack, email Rick from our CONTACT page and he’ll let you know how to get your copy. Kino and Juana say goodbye to Juan Tomas and Appolonia. A family on the run is hunted down by trackers. The trackers find the family and a fatal shot is fired. NOTE: This show could still be available! An expansive work… a testament to 20 years of staying the artistic course. As pleasurably simple as it is entertaining, as rousing as it is inspirational. 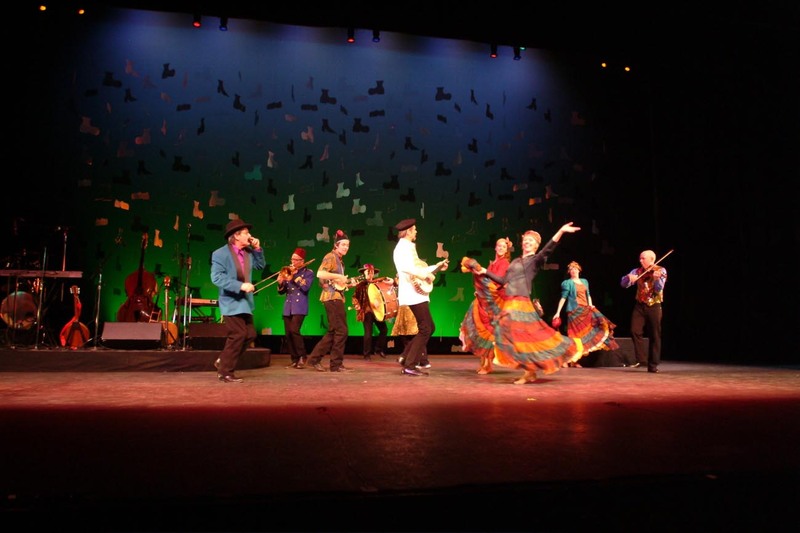 The traditional music and dance of the Southern Appalachians evolved from a coming together – some might say a collision – of British Isles and African cultures during the turbulent birth of our nation. What came of this union is a body of uniquely American traditions that expresses the joy and the sorrow; the heights and the depths of human experience. 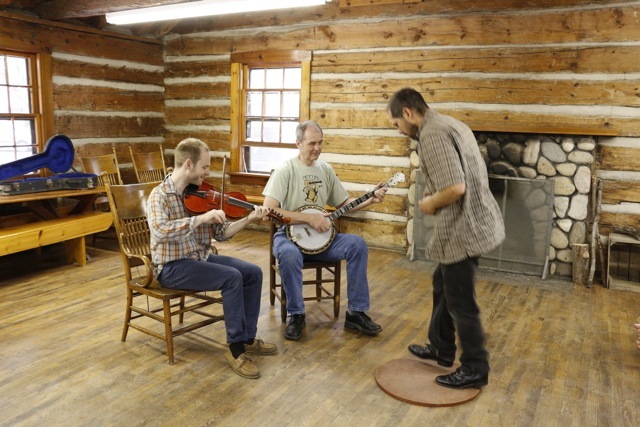 Flatfooting, clawhammer banjo playing, fiddling, square dancing, sacred harp singing, story telling, honky-tonk songs, balladry, hambone, clogging (both traditional and modern) are the elements of old-time music and dance that we have grown to love and made our own. Southern Appalachian traditions became a part of Dayton, Ohio cultural life with the post war migration of blue collar workers and their families from Kentucky, West Virginia and Tennessee. 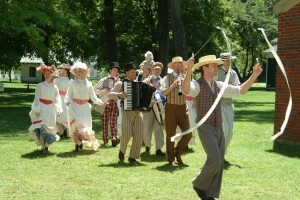 They are presented in Banjo Dance as wild flowers picked from the field and carefully arranged for the stage. Like many of the best things in life, they are simple but not easy. 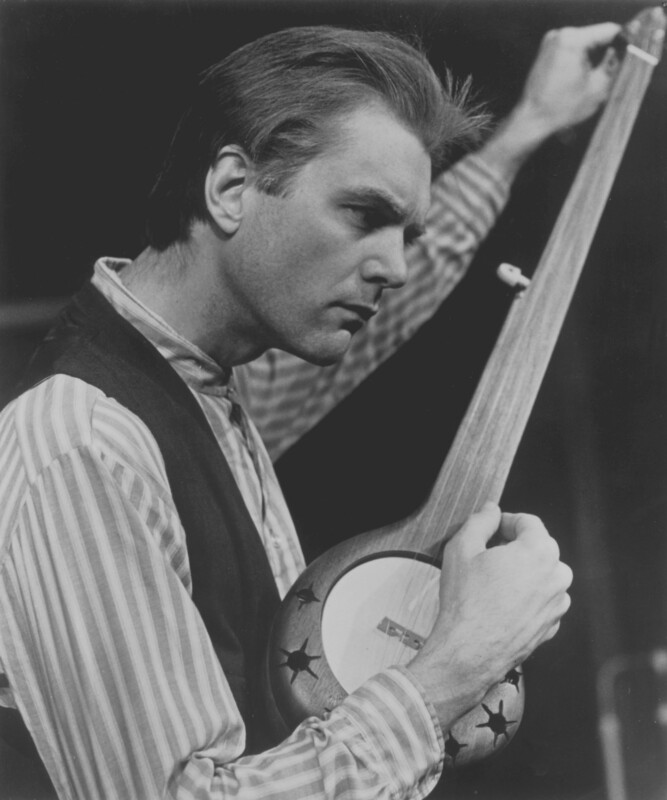 It could be said that Banjo Dance was a work in progress for more than twenty years. 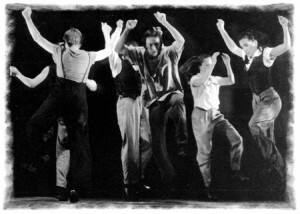 Elements of the production were created and performed throughout our years with Rhythm in Shoes and, in some cases even earlier. 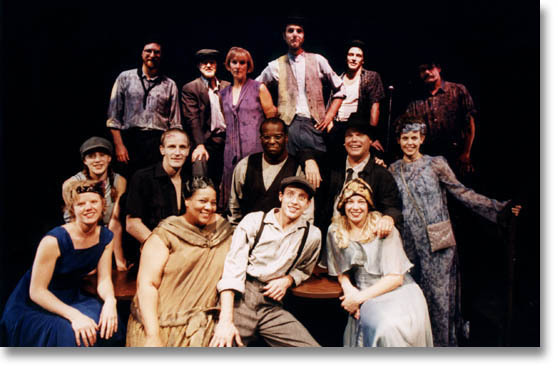 By 2007, it had all come together in a ninety-minute, one act performance that “has legs” as they say, and promises to be remounted sometime in the future. 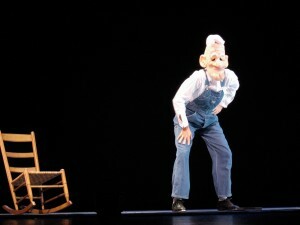 Pappy is a featured dancer in the show and strongly recommends it as high quality entertainment. 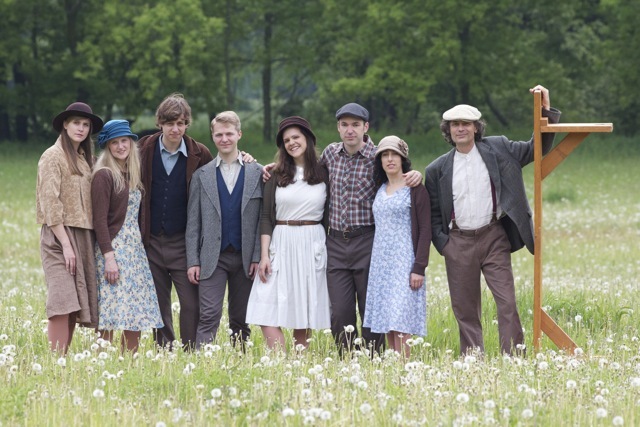 Energetic and effortless… captivating stories about life from the mountains to the factories of the North flowed through the ninety minute program. Long times pals, the Red Clay Ramblers of North Carolina occupied the top of our list as desirable collaborators since our beginnings. 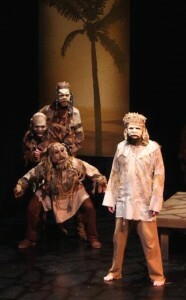 Their award winning work in theater was inspiring and right up our alley. We knew we were rambling at our own risk and rascalism indeed ran rampant with the creation of Rambleshoe. 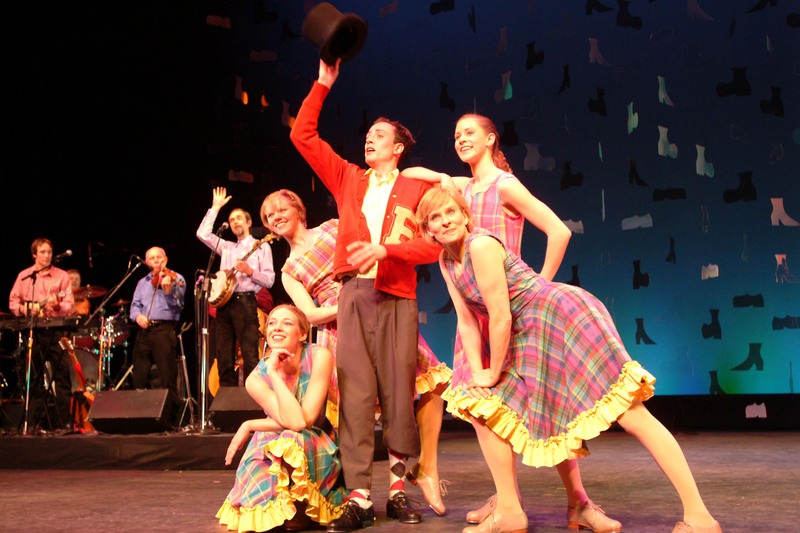 The crossover of Celtic music and clogging, wailing Gospel and Mardi Gras marches is engaging and addictive… The ensemble’s top hat and cane finale is worth the price of admission alone. Everyone who saw the lively and inventive collaboration between Rhythm in Shoes and the Red Clay Ramblers was in the realm of the versatile virtuoso. No one in the twelve member cast of dancers, singers and musicians wore just a single hat. The performance was stellar – the mixture of dance, music, humor and sensitivity kept the show continually fresh and intriguing. It was great to see the audience engaged and applauding so much – they truly enjoyed the performance and the standing ovation made it evident that they appreciated your creativity and energy. Personally, I feel that you’ve created a program perfect for all ages. In the summer of 2003, in the hometown of Orville and Wilbur Wright, Dayton, Ohio commemorated the Centennial of Flight with a citywide celebration. 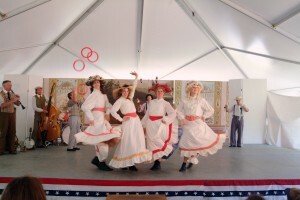 Rhythm in Shoes’ contribution to the festivities was a 1903-era tent show which took place twice a day at Carillon Historical Park. This wildly popular show was such a hit, it was reprised the following summer. Below are photographs from the first year taken by Denise Mangen, followed by a link to video excerpts from the second year shot and edited by Barry O’Brien. NOTE: This show could still available! Some people don’t get it, a blind private eye, but I can taste a bitter lie, feel a shaky alibi, hear the whispered tales behind the secret lives you lead. You think there’s something there because you see it. You think there’s nothing there because you don’t. You think if you look like it, you can be it. Well, you won’t. They say ninety percent of the entire universe is something you cannot see. That makes everybody, everywhere near as blind as me. Beyond that far event horizon there is so much more than meets the eyes and the world as we know it shatters. As above, so below. Always ask someone who knows when it comes to these dark matters. 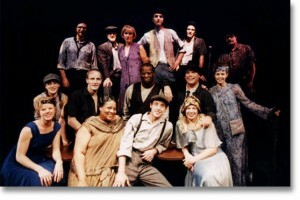 Written by Rick Good and directed by Sharon Leahy, Nova Town had its world premiere on September 29 and 30th, 2000, at the Victoria Theatre. 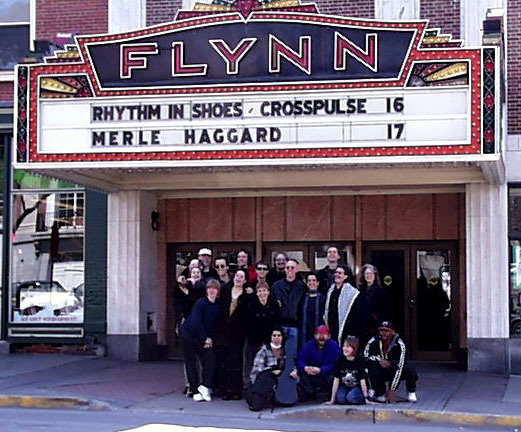 It was a collaboration between the musicians and dancers of Rhythm in Shoes and five of Dayton’s finest actors: Bruce Cromer, Michael Lippert, Jay Pearce, Sheila Ramsey and Michelle Zimmerman. Nova Town is an inner city neighborhood gone to seed. Its residents are the hasbeens and wanna be’s whose lives have passed them by. 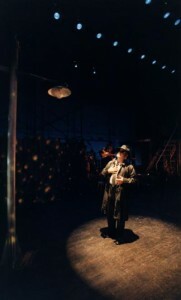 Nova Town is dancing: tap and swing, music: jazz and blues, and physics: astro and meta, all rolled into an original theater production with shades of film noir, beat poetry and sci-fi. Through the interactions of a lovable loser, a worn out bar maid, a doubtful deacon, a blind private eye, a crooked cop and an extra-terrestrial agent of the powers that be, we learn how connected and critical we are to the great mysteries of the Universe, in spite of our inability to comprehend it all. Up & Down: When and how did Nova Town begin? 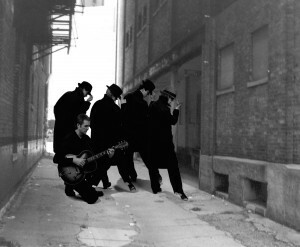 Rick Good: Nova Town began in the early 1980’s as a growing collection of songs I was writing in a blues/swing style. 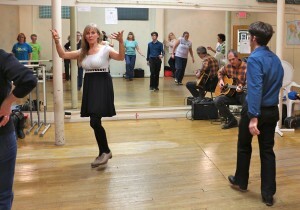 Early on, Sharon (Leahy) and I began working out harmonies to some of them. Eventually, her choreography took the music to a new level. She turned the title song into an exquisite tap ballet. 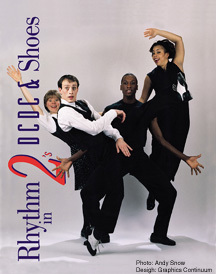 It became an important part of the Rhythm in Shoes repertoire and we were both convinced that someday the material would develop into a full-length music, dance and theater piece. As it continued to evolved, the underlying theme that human experience is mirrored in the heavens possessed me and I read everything I could understand and more about modern astronomy. U&D: What was your process? How did it all come together? RG: It was tricky, but it was also clear to me that here was a colorful place, peopled with fascinating characters and fueled by a universally appealing metaphor. The ingredients were all there. It simmered on the back burner for a long time but I always had at least one eye on it. The creative process can move very slowly, even to the point of apparent standstill. It’s a beautiful and mysterious thing and perseverance pays off. The upside of taking a long time was our company’s growing reputation for doing good work and the friendships we developed with local artists. By the time a script was coming together, we were able to collaborate with some of the best actors in the area. Another key was Sharon’s decision to direct the entire production. Her choreographic skills informed the whole process. U&D: So, you wrote the script and music and Sharon choreographed and directed. RG: Yeah, it was exhilarating, mind-expanding and, at times, terrifying. I learned that writing words on paper and having what pretends to be a finished script puts the piece maybe halfway there. A director’s vision can require some radical changes. Plus, an actor can take a character to places the writer never imagined. U&D: Can you give an example of something that might have changed in the direction? RG: I’d written a scene for the ghost of the crooked cop and the blind private eye (Officer Brown and Frank Galileo). The dialogue was centered around Brown’s remorse and Galileo’s judgment that it was too late, that there’s no coming back and saying your sorry. I had Galileo tossing Brown’s pocket watch to him and it being too heavy for him to hold. Although I liked the dialogue and thought it could work as a scene, Sharon had this visual image of all the characters passing the watch, one to another, while the ghost—who none of them could see—tried in vain to get ahold of it. 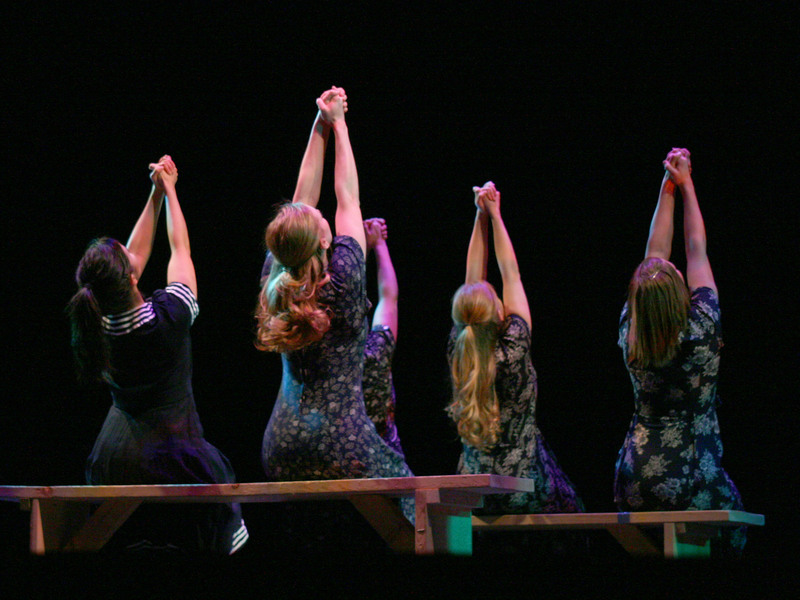 It was wordless choreography that showed the same things I had written. It’s hard to let go at first but you learn to do what works. The director’s issues were often things that nagged at my subconscious. The collaborative process brought them out in the open. For instance, originally I had the crooked cop being killed by a gun. Later, the same rifle was used by Galileo to shoot out the lights of Nova Town so all his friends could see real stars in the sky. I was always a little… I don’t know, uncomfortable may be too strong a word, but something about using a gun just bothered me. I never said anything about it until Sharon voiced a similar feeling. U&D: So what became of gun? U&D: Is Nova Town based on a real place? RG: I grew up in Dayton, Ohio, a city whose pride came from the the things its people made. Now, like a lot of manufacturing towns in America’s heartland, it’s seen better days. I’ve been told by other Daytonians that there’s a resonance. Nova Town is an inner city neighborhood gone to seed. For the residents, it’s also a state of mind. U&D: Who are the residents? RG: I call them Strivers. They’re the hasbeens and the wannabees whose lives have passed them by. They have stories that are more or less true and excuses that are more or less legitimate. 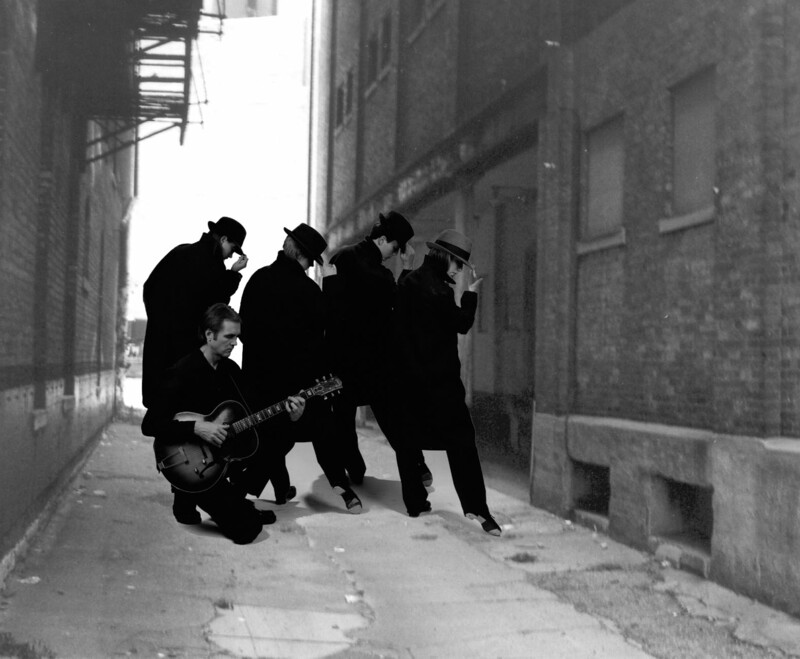 They got a right to sing the blues and that’s what they do. They sing, they dance, they watch out for each other. The character of Dusty, she’s a highly-evolved extra-terrestrial that comes to town, says Nova Town is “very far from the center of things.” To me this means that chances are very slim that day to day existence is going to run smoothly. When you’re a Striver you realize the odds are stacked against you and you take whatever joy you can find. U&D: Tell us more about Dusty. RG: Special Agent Stardust is not from around here. She comes from “a world apart” and it’s she who adds the science to the fiction. When you consider that the human race is both intelligent enough to harness nuclear energy and stupid enough to misuse it, a benevolent race of higher beings that keeps an eye on the bigger picture is a comforting idea. Dusty is an emissary from the “Powers that Be” and she’s sent to Earth whenever it’s necessary to intercede in human affairs for the general maintenance of the Universe. U&D: She speaks of damaging a mirror on a prior assignment. 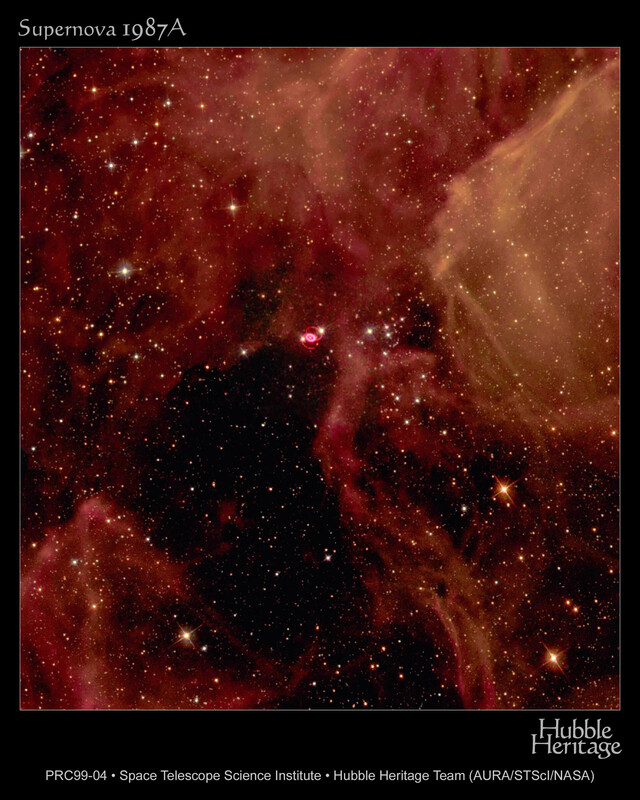 RG: It’s what NASA referred to as the “spherical aberration” in the main reflector of the Hubble Space Telescope. There was a period of time, before that remarkable in-space repair job, that the Hubble was unable to focus clearly because the main mirror was flawed. I considered the possibility that it was not an accident, that there was something up there that someone didn’t want us to see. RG: A wormhole, for instance. Scientists speculate that these tunnel-like structures could spontaneously appear and disappear, linking one area of space to another; a short cut to someplace light years away. Let’s say there was a wormhole all set to materialize right where a fully-functioning Hubble could have seen it. Let’s say scientists would have thought they understood what it was and let’s say they’d have been wrong. People can do a lot of damage when they think they understand something they don’t. U&D: So the “Powers that Be” interceded. RG: Right, to avoid some cosmic catastrophe they sent Dusty down to sabotage the mirror. They knew it would eventually be repaired but not until the wormhole was gone. U&D: Why is she sent back and why to Nova Town? RG: Let’s say the Universe depends on Earth and its inhabitants to play a part in the transformation of energies and the role of humankind involves the evolution of consciousness, specifically our ability to perceive objective reality and the higher forms of energy that are created when we do. Most of us get stuck and sleepwalk through life and shocks from the outside are necessary to get us to the next level. Dusty comes to Nova Town to jump start stalled lives. U&D: How does she do this? RG: She orchestrates a conspiracy of events that transforms the lives of some of the Strivers. U&D: Tell us about them. RG: There’s Kitty McTell, the feisty manager of the local Waterin’ Hole. Long ago, she had a promising career as a dancer but she believes the despicable Officer Brown ruined it all. Brown is a crooked cop who dominates the town’s underworld. He’s used to having his way and he’s made a lot of enemies. Brown’s been tipped off that somebody’s about to rat him out and he’s pretty sure it’s Spats. Spats is a typical hard luck local, the eternal optimist on a never-ending losing streak. He works for Kitty at the Waterin’ Hole and does odd jobs around the neighborhood. It’s his gambling habit that ties him to Brown. Spats is also helping the new minister, Deacon Jones, renovate one of the neighborhood’s many worn out buildings. Jones is the type who’s all head and no heart. He’s yet to have a true religious experience and he’s come to Nova Town for one last ditch effort to build a congregation. Last, but not least, is Frank Galileo: poet, philosopher and blind private eye. His lack of sight is no handicap. 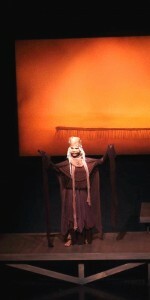 In fact, Dusty finds in Galileo a uniquely awakened spirit in whom she can confide. Nobody but the blind man even senses her presence. U&D: It’s hard to imagine what someone who hasn’t actually seen Nova Town would make of all this. RG: Well we’d love to do it again. Billed as Rhythm in 2’s – DCDC and Shoes, our collaboration with Dayton Contemporary Dance Company paired two nationally-acclaimed dance companies for unforgettable evenings of concert dance that brought audiences to their feet with shouts of Bravo and Encore. The first year included Walk With Me, Sharon Leahy’s choreographic tribute to DCDC founder, Jeraldyne Blunden. The following year featured Hoagland, a suite of dances co-created by Sharon and DCDC artistic director Kevin Ward to the immortal songs of Hoagy Carmichael. 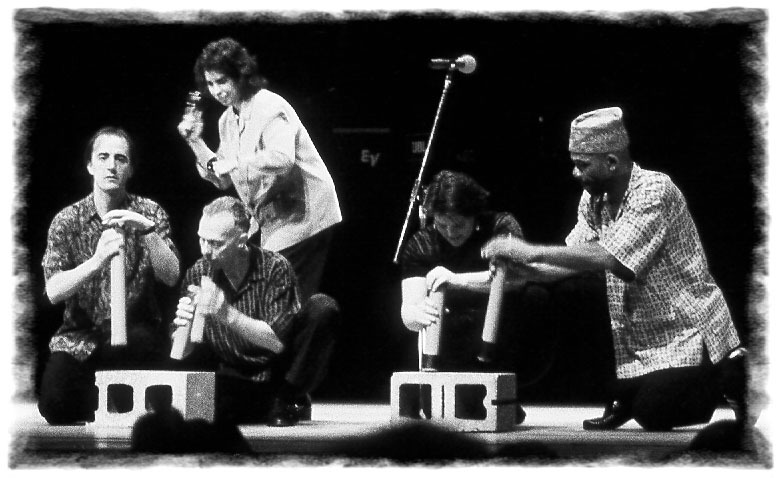 Earlier in the decade we happened to share a concert at Cain Park in Cleveland with body percussionist Keith Terry. 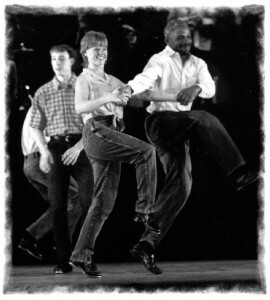 There was an immediate compatibility that led to Abel & Cain, a pairing of Keith’s body rhythm choreography with Rick Good’s original song. 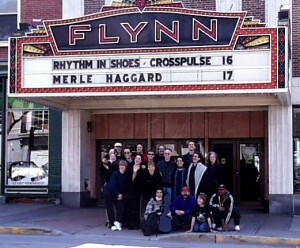 A few years later, a major collaboration with Keith’s group, Crosspulse yielded Time Shifts. “I gotta go, gotta get goin, gotta go, go, go, go. Watch Sevens from Time Shifts. 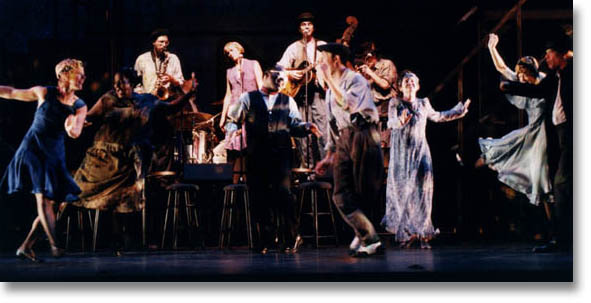 Playwright Tommy Thompson was, for more than twenty years, the banjo player for the Red Clay Ramblers of North Carolina—one of the most successful old-time string bands of the last half of the twentieth century. His experience in theater began with the off-Broadway hit Diamond Studs and continued through his work with Sam Shepherd in A Lie of the Mind. 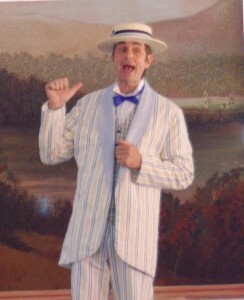 Tommy wrote and performed The Last Song of John Proffit, saying he knew of only one other person who could play the role, and that was his friend, Rick Good. Thompson’s writing and Good’s acting are first-rate. The performer is able to shift in and out of music making without visible effort… his characterizations are richly detailed and totally transporting. An intensely emotional experience. There was no escaping Rick Good’s remarkable magnetism. Good’s multifaceted talent and easy, even nonchalant manner belie the effort of what must be an exhausting one-man performance. Good’s John Proffit, in short, is the essence of American Iliterature of the nineteenth century. The roots of Rhythm in Shoes grow deep in the ground of American tradition, particularly the banjo and fiddle music of the rural South. Relatively speaking however, the United States is young country whose traditions go back only a few hundred years. Before that they are rightfully the fruits of other cultures. In the case of Old Time American music, it is the merging of the African banjo with the repertoire of Irish fiddle and pipe tunes that begat something now considered uniquely American. Through the development of this music, one can trace the history of blacks and whites as it both collided and united in the cultural fusion that so energizes our society. One of the most successful artistic renderings of this phenomenon is Tommy Thompson’s one-man play, The Last Song of John Proffit. 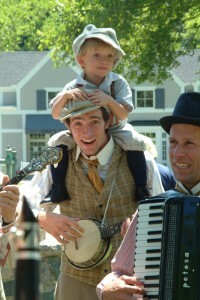 Set nearly 100 years ago it is the story of an old man who once performed with the legendary minstrel Dan Emmet, the man to whom history attributes the authorship of Dixie, the anthem of the South. As the story unfolds, we travel the winding path of John Proffit’s personal history, learning the dark truth about Dixie and America’s music. At the center of the drama is the banjo—on the surface, as American as apple pie—in reality, an ultimately disowned instrument of the African slave. The audience experiences both the attraction and the revulsion of early American minstrelsy through the humor and horror of the old man’s stories. 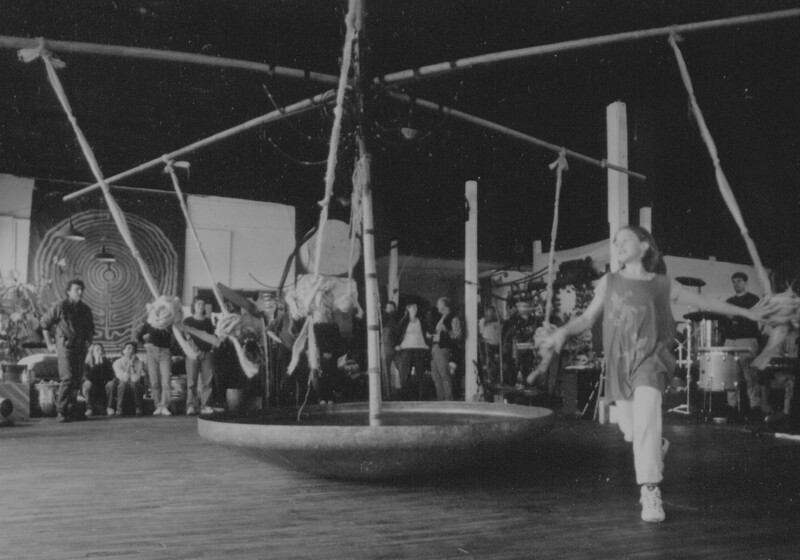 A ten year old Emma dances around the bowl at rehearsal in Michael’s studio. Musician and sculptor, Michael Bashaw and his Puzzle of Light ensemble worked with RIS from the ground up, recreating a world where the Goddess ruled in Do You Remember This? To honor the memory of women who were burned for their knowledge, both literally and figuratively, Michael made the Memory Boat. Starting with a metal bowl, seven feet in diameter, the dancers added a mast and arms, creating a Maypole to weave and unweave. The arms were then hung with gourds, bells and drums. Water carriers filled the gourds, which emptied onto the drums. Musicians played hypnotic rhythms on every surface of the sculpture. The dancers grew in number, multiplied by the participation of over thirty women from the community. It was theater as ritual and it celebrated the old world while promising a new one where the wisdom of the Goddess could live again. Watch Rapper/Reed from Do You Remember This? John Giffen, choreographer, performer and Ohio State University dance faculty member, creates deeply moving work both humorous and poignant. When commissioned by RIS for a piece of choreography, he delivered the beguiling One if by Land. Looking once again to the old-time music community, we brought together other fellow visionaries who were rooted in tradition but striving to create something new as well. Musicians Chad Crum, Pete Sutherland and Lee Blackwell were added to the band with hoofer Ira Bernstein and dozens of volunteers from each community augmenting the dancers. 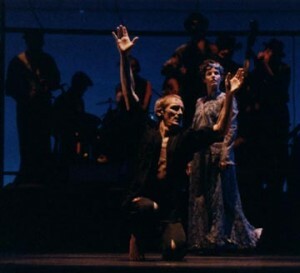 Commissioned by Cityfolk, Jacob’s Pillow and the Flynn Theater, Streets of the Capitol emerged as a work of profound depth, featuring music newly created by the assembled ensemble. Also included was All the Houses, Chad Crum’s enigmatically hip composition for solo fiddle and spoken word. Tap legend, teacher and director of the American Tap Dance Orchestra, Brenda Bufalino was an early mentor of Sharon’s in New York City. 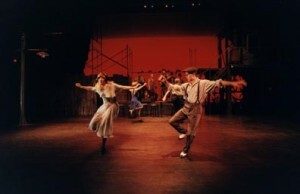 Commissioned by RIS for a piece of choreography, Ms. Bufalino chose for her music Hoagy Carmichael’s The Old Music Master. She shared the Victoria stage with us that same year. As part of Viva Victoria! 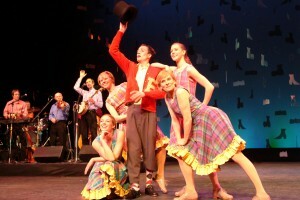 week, celebrating the major renovation and reopening of the Victoria Theatre in downtown Dayton, Cityfolk presented Rhythm in Shoes and The Horse Flies. An old-time band gone electric, The Horse Flies created the perfect sonic backdrop for Sharon Leahy’s innovative choreography. With roots in the same fertile ground of American traditional music and dance, the results were a revelation to an astonished audience. So successful was this collaboration, it was revisited in 1992 with the addition of several new pieces. Watch What Does Family Mean? from our second Horse Flies collaboration.